Al Filreis: Peter Quartermain, who has written a close reading of this poem, says about the beginning that it sounds almost like doggerel. And he was on his way to praise its very striking rhythms. Anybody want to say something about how the poem sounds, of course, now that we’ve heard Zukofsky reading it? What does it sound like at the beginning? Bob Perelman: Well, I remember the first time I read this poem and being delightfully bollixed by the first line, thinking, now, wait a minute, what did I just read? It was because of the punning. It’s about seeing and thinking, but clearly sound is in play as well. And the interplay between all the senses and the trans-sensual waves that he is talking about are all there in a nutshell in that opening line. Filreis: The homonym comes metrically halfway, so see-sea divides a mostly metrically regular line into two bits. It gives way to longer lines, but at the beginning it is almost like doggerel. Charles Bernstein: People who don’t have the text of the poem can’t tell that the first sea is S-E-E, and the second is S-E-A. Filreis: You can’t tell from context? Filreis: Like an electric current, almost. Bernstein: Like a sea. Right. Wystan Curnow: It’s less doggerel a line when you hear him read it. Filreis: Less doggerel hearing it than seeing it on the page? Curnow: Than seeing it on the page. Filreis: Does anybody think Zukofsky is speaking knowledgeably about the world of electromagnetic science and radio? Perelman: Yeah, a physics textbook on light that talks about exactly the same thing: matter and energy transforming back and forth. So, it’s a sort of mini-version of “A”-9, and a more discursive, relaxed version. Filreis: Wystan, to what extent does, as Bob was suggesting, the actual thinking about electromagnetic science, radio wave, and so forth, serve his purpose as a poet, aesthetically? How does it work? It’s not an end in and of itself, is it? Curnow: I don’t understand the physics — I don’t know what a condenser is. Filreis: I imagine that most readers of this poem go into it not knowing about that. Curnow: So, then I want to look it up. Then I wonder about looking it up. Filreis: You mean, whether that would be productive? 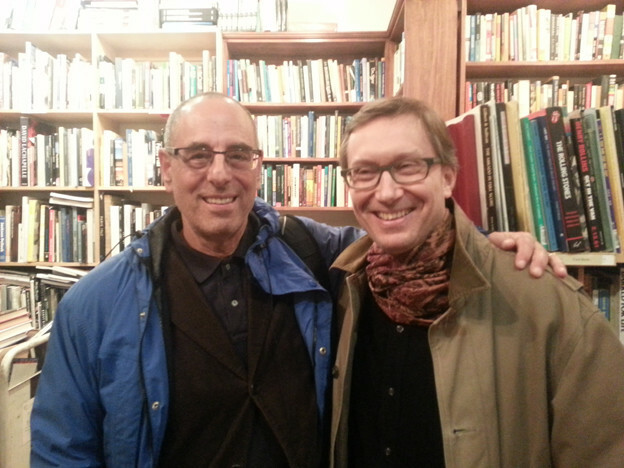 Bob Perelman and Wystan Curnow at the Kelly Writers House. Curnow: Whether it would be productive, because I also thought there’s an attempt here to look at some kind of physics, but the intention actually is to propose something to do with meaning. That is very implicated in polysemy and metaphorical applications. The way those terms actually get localized to their very specific uses and then become unrecognizable as ordinary words, or as words that operate in other forms in other parts of the language. My sense is that’s happening here just with condenser and condensed, as an ordinary word: it’s that round and round and round that I got to. Filreis: But is there a relation between condenser, in a physics sense, and the poet’s act, especially in the opening lines of condensing large material into short lyric lines? Filreis: This being the poem itself, or the workbench of the poet. Bernstein: And also stress, the double sense of stresses: electric stresses across condensers, then there’s another stresses later. Bernstein: Both of those suggest sound stresses, as in metrical poetry, but, at the same time, electrical impulses, to which there could be a connection. Filreis: What is the connection between this vocabulary of physics and the wonderful stuff at the end about seeing many things at once, the harder the concepts get? Bernstein: The material at the end is a very beautiful and touching poetics when Zukofsky turns forty: “Which is a forever become me over forty years.” I think the poetics, in respect to quantum, goes back to Einstein’s theory of relativity: relativity and meaning are context-dependent. Filreis: And you of course have the child inside the poem. Perelman: And you have the child, you’ve got the flowers, you’ve got the retina turned, made human by light. I mean, that’s pretty Wordsworthian, with more succinct vocabulary. And the identification with the seeds, “the weed / One who works with me calls birdseed.” This is, after all, the poet who writes “A” and I think very much identifies with any one of those little seeds. You know, the little word a, the little anything, the little mote, is also the infinity that is his human life. The big flower will find a vase, the little flower is just as valuable and as potent and as enlargeable, or it contains the world just as much. Filreis: So, it’s the romanticism of the child put into the context of twentieth-century science, of Einsteinian and quantum science. Because this isn’t “I go back to child,” this is “I am simultaneously child and me.” That produces multiple subjectivities and multiple attentions. Bernstein: — the harder the concepts get, or nothing. But the or nothing is crucial. Filreis: So let’s go large, then. Anew is said by many people, and maybe it’s simply a facile conclusion, to be a way of starting afresh. Zukofsky’s biographer Mark Scroggins referred to this as part of a move away from the political toward the personal — I probably would quibble with that. Williams, who loved this book and reviewed it in 1946, said this is a new line in a new measure, this is adult verse. And another critic said that this is a fresh beginning. Partly, I think, they were relieved by the fact that “Poem beginning ‘The’” had this sort of vortexical, Poundian documentary collage style, which drove them all crazy. Anew you can probably read without that. So maybe they were cheating and being easy, but to what extent is this different from the earlier Zukofsky? To what extent is it continuous? And Anew means a fresh start: I mean, somebody said this is his La Vita Nuova. Would one go that far? Bernstein: I think, following up on what Wystan said earlier — if he would look something up, would it tell him something — I’d say no. The poem is not comprehensible in the sense that it will restore you to the knowledge you already had of what those words were. The words in the science itself are metaphorical: particle, ray, light. Bernstein: I think this poem is as complex and difficult as Zukofsky ever is, and as absolutely what it is, as an object or another thing in the world, which is refracted like light through a prism. Charles Bernstein at the Kelly Writers House. Filreis: So, Bob, what’s your take on this idea that Anew is a fresh start for Zukofsky in terms of his poetics? Filreis: No, by no means. Perelman: — or the obsessive-compulsive patterning in “A”-9, to use a clinical term I am only using metaphorically, but, in fact, it is: “Gee, I’m forty, I’m thinking about my entire life, I’m thinking about my childhood, I identify with this little bit of pollen on the flower,” et cetera. Bernstein: The child could also be Paul, who was just born at that time. Filreis: He would be two at the time, right? Filreis: Full stop, new sentence. Curnow: Yes. I mean, it’s almost as if the second part is an add-on or another poem. Perelman: The first part is really all about the speck, the sea, the mote, the physics, the tiny becoming infinite, and then this science is almost a criticism or a, let’s think about it, reflect on this. 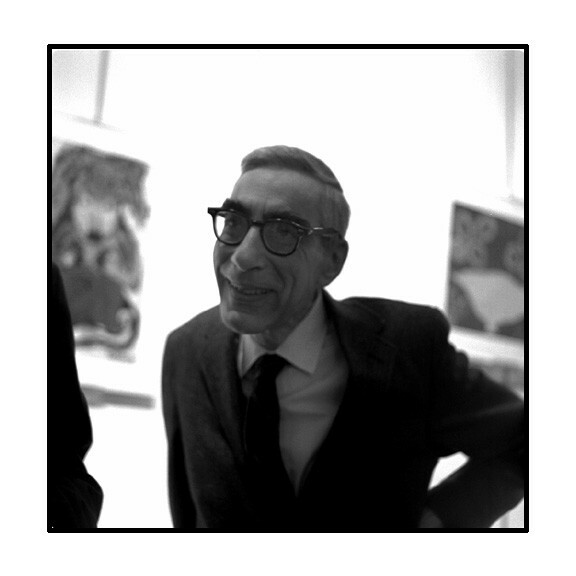 Filreis: I would ask any of you, or maybe all of you: why is Zukofsky not better known among the modernists of his generation and the one just before? There are probably complicated reasons for that. I mean, for one thing, isn’t it the case that only one or a couple of books are in print? Bernstein: The only book of his poetry that’s now in print is the Selected Poems from the Library of America that I edited. Filreis: It’s a beautiful book. Bernstein: And it’s highly condensed, Zukofsky in only 150 pages. Perelman: Condensed into a speck. Filreis: And you included this poem. Why? Bernstein: I felt it was a key poem within this sequence, and I wanted to edit the whole volume along Zukofskian principles of condensation and specks, metonymy, the parts standing for the whole, so that it would be a good introduction for somebody who has never read Zukofsky. The scale is greatly diminished in terms of size, but all the different aspects, or most of the different aspects, the crystalline aspects of his work are present. Another question could be: why isn’t poetry better known? Why isn’t American poetry better known? Filreis: So, you feel it’s an analogous question, because some of the poets we admire are better known than Zukofsky. Bob, any sense? You love Zukofsky. Filreis: Any thoughts on that, Wystan? Filreis: It doesn’t require too much external work. Curnow: It’s the package that people expect poetry to occupy. Anything larger than that is regarded as a challenge by publishers, by readers, and so on. Bernstein: But there’s another side to it, which I think goes back to perhaps my generalization that you questioned. To use a scientific term, Zukofsky has an incredible half-life. Many of the poems that were published in 1944 have no bearing on us right now in 2009. This poem still has a life and it becomes more and more intense. And for the people interested in second-wave modernism, or modernist American poetry, Zukofsky becomes more and more significant each year. So, perhaps, that’s the trajectory that goes against the idea of popularity. Filreis: Let me ask each of you to offer a brief final word on this poem, or maybe something more on what you get from it. Curnow: Well, I’ll start because I’m the least expert in Zukofsky. I’ll just say that what we’re talking about, you know, what puts people off poetry, the kind of syntax, the kind of difficulty, the sense that the meaning is spreading that occurs line by line, phrase by phrase, is something that I enjoy per se, right, and think that if I spend more time and effort, I’ll get more from it. What puts some readers off is precisely what attracts this reader — and I’m not alone — to this poem. Filreis: Well said. Thank you. Perelman: I’ll just say it’s really a great poem, one of, I would say, Zukofsky’s greatest hits. There are many. This is certainly one of them. Filreis: Thank you. I agree. It is absolutely stunning, absolutely open, and there’s about three or four things you can do with it, including the Romantic trope that we were talking about.